Pierre-François Ouellette art contemporain is pleased to present Aquariums of Toronto an exhibition of new works by Ripley Whiteside on display at Centre-Space from December 3 – 24, 2016. At first glance, Whiteside’s suite of large and medium-sized drawings appear as menageries of colourful and exotic aquatic species. In Spadina (2016), for instance, a lithe and green-coloured American eel descends diagonally through the water towards its unsuspecting prey – one of several Siamese fighting fish that occupy the same glass enclosure. 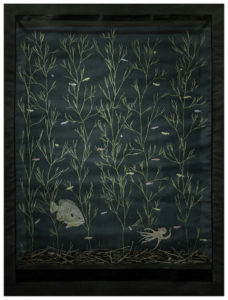 Like all of the works in this exhibition however, Whiteside’s juxtaposition of rare, beautiful and foreign underwater species now found in the Greater Toronto Area is informed by a deeper investigation of the ecological consequences of both aquacultural development and our need for spectacle. As a rapidly expanding global city, Toronto has experienced growth that has been costly to biodiversity. Loss of habitat, pollution, overfishing and other environmental problems that accompany development have significantly impacted ecosystems of Lake Ontario and other local waterways. Globalization also presents us with strange and accidental migrations of great consequence: the integration of the Great Lakes into global trade networks via the St. Lawrence Seaway inadvertently resulted in the introduction of invasive species—like the round goby and zebra mussel—into Toronto’s local underwater environment. Originally from North Carolina, Ripley Whiteside is a Montreal-based visual artist. He graduated with a BFA from the University of North Carolina-Chapel Hill in 2008, and earned a MFA from the State University of New York-Buffalo in 2012. He has participated in solo and group exhibitions in the U.S. and Canada, and is the recipient of various grants and residencies.